Review of Andrew Harding’s latest book, ‘The Constitution of Malaysia: A Contextual Analysis’ published in the Star on 17 February 2013 here. Join Harding and his friends at the official book launch on 23 February 2013, details here. A CONSTITUTION document is but a written text, its practice and survival uncertain and fragile. The Proclamation of Independence of Malaya dated Aug 31, 1957, contained the stirring words to the effect that the new nation will advance as a Constitutional monarchy based on a Parliamentary democracy. With this statement the goal of nationhood was articulated, and that elusive yearning for the realisation of “the imagined community” (as Benedict Anderson’s time worn phrase puts it) was launched. This work is part of the Hart Publishing (www.hartpub.co.uk) series on Constitutional systems of the world; Dr Andrew Harding is general coeditor of the series with Peter Leyland. Harding’s book is a compendious stock taking of the uncertain journey of this text that was to inform, demarcate and delineate the contesting polities of nascent nationalism. What is compelling about this work is that it weaves a narrative out of the dry bones of the text, a narrative that teases out the leitmotif of Malaysia as exemplary of a Developmental State. The survival of the Constitution is by no means an assured historical fact. Whether the so-called Merdeka Constitution has been amended beyond its substance and identity is a major subtext of Harding’s reflections in The Constitution Of Malaysia: A Contextual Analysis. Harding is a pre-eminent jurist and has taught, mentored and written on the Malaysian Constitution for decades. Currently, he is professor of law and director of the Centre for Asian Legal Studies, Faculty of Law, National University of Singapore. He brings his learning to bear on eight major trajectories that confront Malaysian experience with the Federal Constitution. The learning is worn lightly, however, and concerned citizenry with no legal training will find a sure guide through the structure of the Constitutional labyrinth. The historical backdrop is sketched admirably and deftly interweaves each chapter. Chapter two is an overture to the whole work. In this section, the narrative of a dominant Executive that extended its grasp into all levels of governance is set out clearly. The office of the Prime Minister being intolerant of inhibitions, whether judicial or juristic, based on the mantra of development is ably charted. The debate over what is the nature and scope of the Malaysian social contract is analysed together with its “ineluctable conundrums”. The analysis of the fate of the Parliamentary democracy and the tensions of pluralism within a tenuous democratic state is realistic here while also being hopeful. There are harsh realities of power configurations and competing elites impatient at being circumscribed in their assertions of power interests. Harding draws us a canvas of such competitiveness, including the 1983 Rulers Crisis and the 1988 judicial impeachment of the Chief Justice and the five Supreme Court judges. Post the watershed event of May 13, 1969, Parliament could have been eclipsed completely but the so called Rukunegara amendments of early 1970s demonstrated its obituary was premature. However, the amendments since then still cast a long shadow over entrenched rights. General elections are given a concise treatment in chapter three, which charts Malaysia’s election processes with the useful and stimulating role of political parties in the Dewan Rakyat. The analysis of the role of Constitutional Rulers is intriguingly placed under the rubric of territorial governance linked to State Constitutions. One of the paradoxes of modern Constitutionalism is that there is evidence that regimes with a Constitutional monarch can have sound democratic practices, and Malaysia’s experience in this is illustrative. There are challenging cases, though, as seen in the Perak Mentri Besar 2009 case of Nizar v Zambry in which the people’s sovereignty as represented by the office of Chief Minister yielded to a judicial ruling in favour of the Ruler’s residual power of dismissal. Harding’s cautionary note on this case is salutary, and his caution that it “is not apparent in the Constitutional text or in the general understanding of conventions” gives us reason for critical pause. Many such comments illuminate the cases discussed in this book, which will be a boon to lawyers and also political scientists. Conventions and their role in construing the Constitution is a pervasive issue (for example the Tun Mustapha v Pairin case in 1985) that raises conflict and argumentation. Here, political morality intersects with Constitutional governance, a fertile locus for deeper investigations. Chapter six, on human rights and the authoritarian state, hits the right notes, and the intersection of liberal democracy with an emphasis on a rights-based approach with weak institutional support in the face of emergency powers is desultorily described. A hopeful but realistic note is sounded in describing Suhakam’s (Human Rights Commis­sion of Malaysia) work. A section on indigenous people’s rights closes a fascinating chapter. The concluding chapters on the judiciary and also the role of religion augment the work with analytical finesse. The religious tension over burials, custody of children, apostasy and the use of “Allah” in non-Muslim texts are where the deep waters of Constitutional interpretation will continue to reverberate. As Malaysia faces the demands of dominant ethnic-religious elements with claims of modernity and a secular ethos, the fate of our nation will in part be determined by how much the Malaysian Constitution still matters and how it can arbitrate between and reconcile warring factions. If it is not to suffer the fate of the Weimar Constitution (of Germany, after WWI) or many African Constitutions, it will be in part because us readers have pondered the lessons contained within the pages of this admirable work. 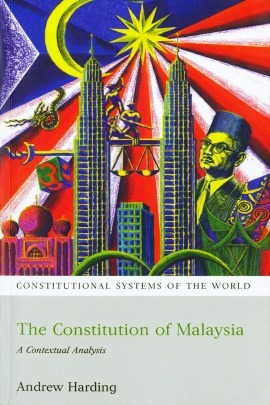 This book should find its place in every person’s library; while there are occasions when one can demur from the writer’s opinion, The Constitution Of Malaysia: A Contextual Analysis is, nevertheless, a resource for engagement and vital critical discourse. The Constitution Of Malaysia: A Contextual Analysis will be launched in Malaysia on Feb 23 at 11am at Pusat Rakyat LoyarBurok (No. 3-4, 4th Floor, Jalan Bangsar Utama 3, Bangsar Utama, Kuala Lumpur). Author Andrew Harding will be present to discuss his book. Malaysian lawyer Philip Koh co-edited Sheridan & Groves’ The Constitution Of Malaya (5th Edition) and has been involved in a number of landmark public and constitutional cases. Malaysian lawyer Philip Koh is actually a corporate commercial lawyer who is an interloper into the public law sphere. He co-edited Sheridan & Groves’ The Constitution Of Malaya (5th Edition) and has been involved in a number of landmark public and constitutional cases. Philip is a senior partner in a Klang Valley based firm. In previous incarnations he was in academia and worked for a listed corporation. He has published on a myriad of matters ranging from corporate governance, constitutionalism, book and movie reviews. He sits on various boards, bodies and spacecraft but prefers to read, write and give talks whilst trying to remain sane. Posted on 18 February 2013. You can follow any responses to this entry through the RSS 2.0. Read more articles posted by Philip Koh. Because may be pOinted out, standard may be the excellent stratifier, which is within the foldable from the masturbator sleeves that folks could be sieved.